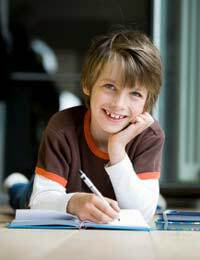 Home > Advice for Parents > How Can I Make My Child's Homework Fun? When a child views homework as a chore, this can signal stress and frustration for all the family. As a concerned parent, you want your child to enjoy their studies and to gain from them. There is no single solution to this particular homework dilema, but taking steps to bring a little variety into your child's homework life and encouraging them to find fun in the tasks they have been set is sure to improve the situation. Creating the most comfortable homework environment possible for your child is a vital. Remember that each student works in distinct ways and will flourish in different conditions. Encourage your child to think about the way in which they work best. Do they like to work alone in silence, or with others around? Does listening to quiet music help them to concentrate? Ensuring that they have all the materials and stationary they might need to hand is also important. If your child responds well to clever designs and cartoon characters, you might consider investing in fun, themed stationary to brighten up their study sessions. For more inspiration, take a look at the other articles on this site which focus on getting the homework environment right. Always check that your child has eaten a healthy snack before they begin work. You might even like to make something new and quick together to get them feeling creative before they start on their homework task. Taking an interest in your child's homework tasks is a sure-fire way to help them to feel more connected with, and inspired by, the homework tasks they have been set. Before they get to work, you might consider asking them to explain what they have been set. You could ask them what their initial ideas are and which part of the task inspires them the most. Be excited by their ideas, discuss and even debate them. Let them know what you find interesting about the points they have made. At the same time, remember to let them form their own ideas and to think independently. Keeping a good balance is key. Homework is vital in helping a child learn to work alone with confidence and without assistance. However, some students may initially find this experience alienating. There are a variety of things that you can do to ensure that they feel engaged and supported but are still building upon their independence. If your child is revising for a test or committing a set of information to memory, you might suggest that they spend half an hour alone learning all that they need to. You could then get involved and help to test them once that time is up. This will give them a goal and a moment of play or competition to work towards. If they have been answering a list of questions or creating a piece of personal writing, you could ask them to share their ideas with you once the task is completed. This 'feedback session' will help to reinforce what they have learnt; they will understand that their time has been spent wisely and will experience a sense of satisfaction. In this way, you can help your child to see that homework can be fun. There are plenty more things that you can do to bring a little magic into your child's homework life. Planning educational trips or encouraging them to join a homework club are just two extra ideas. Seek your child's input and ask what changes they would like to make to the way they work. The trick is to show interest and to be involved in their homework whist simultaneously ensuring that they ultimately remain in control.